This is Matthew Ford’s sixth album for Diving Duck Recordings and his fifth album, “Portraits” was previously reviewed on Jazz Views. On “Portraits he was accompanied by a four piece rhythm section and that rhythm section is retained for this recording plus a full size big band. Eighty per cent of the tracks on the album are well tried standards which have been covered a multitude of times by many singers. 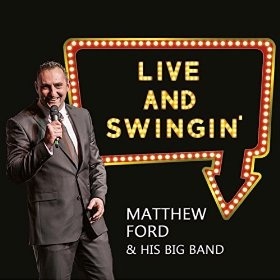 This is Matthew Fords regular concert programme and will go down well with his regular audience and will sell in numbers at his live gigs but will possibly struggle when on the dealers shelf amongst other well known singers. Matthew Ford has a fine stylish voice but there is nothing extra which gives him that extra edge which would give him that unique quality to take him to the top. “It Only Takes a Moment” is a good song to open an album but Mathew Ford does not really do it full justice. “If I Never Sing Another Song” and the medley “Portrait of my Love / Walk Away” which much better done by Matt Munro and Matthew Ford’s attempt falls far short of this standard. The track “Artificial Flowers is something of a departure but is well worth the effort as it is one of the better tracks and warrants it’s inclusion, a little more of this sort of seeking out songs which are not heavily covered elsewhere might have enhanced the album. This is really one for Matthew Ford fans at has a little of interest for the general customer with so much superior releases on the market.